This book is a selection of 40 articles from the Royal Irish Academy’s Dictionary of Irish Biography, dealing with 42 men and women whose careers, in one way or another, were deeply involved with the Easter rising of 1916. The biographies selected compose an inclusively broad picture of the rising, representing the spectrum of personalities and perspectives that were involved in the event. They include not only the insurgents (and some others) killed during the rising but also some of the women who were involved as soldiers or in supporting capacities; three nationalist leaders who opposed the rising; some of the senior figures in the British administration in Ireland in 1916; members of the British army that suppressed the rising; and two historians who made considerable contributions to the scholarly debate on 1916. This selection aims to give a balanced view of the rising. 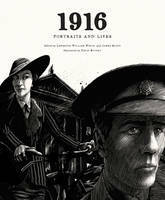 In addition to the biographies, there is an extended introduction by Patrick Maume, Queen’s University Belfast, and each biography is illustrated with an original drawing by artist David Rooney.